A 52-year-old Chinese woman incidentally noticed that she had a painless left breast lump. A mammogram was obtained. Q1 What are the mammographical findings and the diagnosis? The mammogram shows a dense, lobulated, well-defined lesion in the upper half of the breast, with popcorn-like calcification (Fig. 1). There is no associated architectural distortion or microcalcification. Appearances are typical of an involuting calcified fibroadenoma. Q2 What is a fibroadenoma? A fibroadenoma is the most common benign solid lesion of the breast. It is produced by an overgrowth of stromal connective tissue of the lobule, often accompanied by a variable overgrowth of epithelial structures.1 The cause is unknown. They are most common in young women in their twenties and thirties, and may regress after menopause.1,2 There is no racial predilection.2 Clinically, these lesions may or may not be palpable. When palpable, they may be felt as oval, freely-mobile, rubbery masses.2 They can be hard on palpation when calcified. Being mobile on palpation, they are sometimes called ‘breast mice’. Postmenopausally, they may regress and often calcify. Q3 What are the typical radiological findings of a fibroadenoma? On mammography, fibroadenomas are usually seen as a well-defined, sharply-circumscribed lesion, and may be lobulated. They may have a thin lucent ‘halo’ around them.1 Calcifications are common, especially in postmenopausal women. Most of the calcifications are coarse and the so-called ‘popcorn calcifications’ are pathognomonic for fibroadenoma. On ultrasonography, fibroadenomas can be extremely variable in echogenic characteristics. Typically, however, they tend to be well-circumscribed, homogeneous, oval, hypoechoic lesions with sharp margins which may be lobulated and show variable acoustic enhancement.1,2 When calcified, they show extensive after-shadowing. Q4 What is the prognosis and risk of carcinoma? Q5 What is the treatment? 1. Kopans DB. Breast Imaging. 1st edn. Philadelphia: JB Lipincott Company; 1989: 262–5. 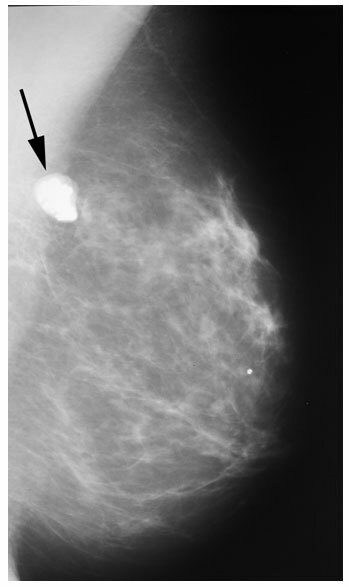 Fig 1 Mammogram (medial lateral oblique view) of the left breast shows a dense well-defined lesion with the typical ‘popcorn calcification’ (arrow) of an involuting fibroadenoma. It has lobulated margins with a faint lucent halo.